According to the bookmakers, Victor Crone will take Estonia by a ‘Storm’ next Saturday and represent the country at the Eurovision Song Contest 2019. In this article we give you a preview of the Eesti Laul 2019 final, with the main contenders for victory listed for you. Apart from Victor Crone, there are some other familiar names or more than decent acts in the competition. The piano ballad from Stefan, Tanja and Birgit who try to return to Eurovision and Sandra Nurmsalu attempts to make a come-back after 10 years as well. ‘Storm’ by Victor Crone is a very accessible “Scandinavian” sounding song. Victor Crone is the favourite of the bookmakers by a landslide. Victor starts standing solo with his guitar and gives away a charismatic performance, which ends with a female backing singer standing back-to-back with him. Not so far behind Victor Crone, the bookmakers list Uku Suviste as his main competitor. The act is unique, as Uku stays off screen for more than a minute. This might make it hard for viewers to connect with him, should he make it to Tel Aviv. The pyro for the finale will most likely go along with him to Israel. With a ukelele, Inger gives a young and sweet performance in ‘Coming Home’. There is the appearance of a likeable winner, but one might expect the somewhat weak vocals (Kermit the Frog, anyone?) will hurt the chances of actually winning the competition. Stefan starts behind the piano and makes impact with his song ‘Without You’. He manages to connect with the camera well and cannot be rules out as a surprise winner in the competition yet. Estonia: Who will win Eesti Laul 2019? 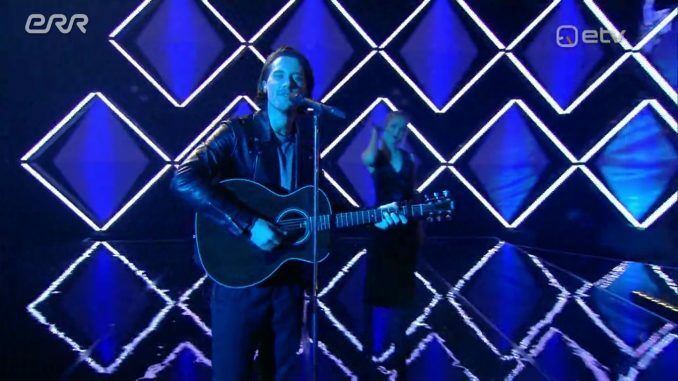 The bookmakers have predicted Victor Crone as the winner of Eesti Laul 2019. Will he also get the job done? Stay tuned to ESCDaily next Saturday, as we will follow the conclusion of the national selection in Estonia for you.